Travel advice to a fairly unknown region, Iran. Experiencing Persia in a different light. Iran, a country, I never thought of visiting or backpacking in. With George W. Bush listing Iran as an "Axis of Evil" and once sanctioned, bordered by unstable countries, there were a lot of uncertainties and puzzled looks when I told my friends and family that I am going to travel to Iran. With the current Trump presidency, Iran has been in the news and what for? In response for being a muslim country and the country's continued illicit nuclear activities. Beyond the negativity and hype, I wish people gave this country a chance to visit. 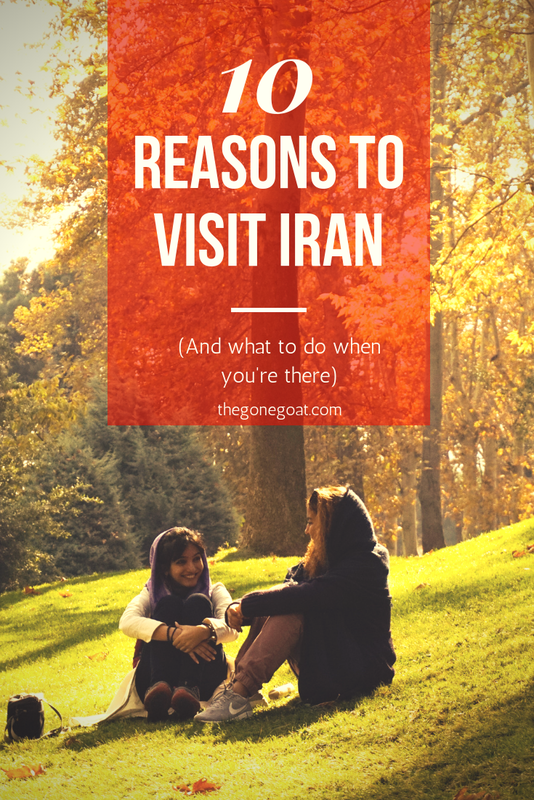 Here's how the conversation was like: "Why travel to Iran? Are you crazy? Well, if people visit Jordan which borders near Syria and it's still safe, so why not Iran. But, it's Iran, it's the wild wild west, that's where Taliban is." But as it turns out, everyone was wrong! I read several blogs like the Broke Backpacker's guide to Backpacking in Iran and came across people who had good things to say about the country. In particular, the people. I have always been drawn to places where people and landscapes are what matters. Big cities, don't do it for me. Throw me in a place, alone, where it is slightly rugged, where the people are curious, where it is freeing to land on unknown terrain, where forbidden trails lead to the most interesting conversations. By reason of these things, I learn the most and often feel thankful and hopeful that we're all similar in one way or the other. I spent 2.5 weeks backpacking in Iran starting from Tehran-Esfahan-Kashan-Yazd-Shiraz-Tabriz and it had been a whirlwind of a ride. A quick google search about Taarof and you'll learn to know that there is no friendlier nation than the Persians themselves. It's part of who they are: humbleness and respect. There were instances where I was taking a stroll, and people would walk up to us just to strike a conversation followed by an invitation for tea. Taarof, is a form of civility and respect and when you're offered invitations, you should counter or insist to pay. It is only when the Iranians persist with offering it for free at least three times that you should accept it. If you're lost on the streets, Persians out of genuine hospitality would never hesitate to stop and accompany you to your destination to ensure you've reached your destination safely. There were so many encounters of Persian hospitality, that I would need a separate post for this. From colours to intricate mosaic art work, and spell-bindingly beautiful bazaars, the incredible mix of all these put together really blew my mind away. Not disregarding that I was about to learn about one of the oldest civilizations to ever exist in this world. The picture above was taken at the infamous pink mosque in Shiraz, known as Nasir-ol-Mosque. This is a place where truly light and worship intertwine. It was slightly off-putting that I had to deal with a number of tourists and people who would try to launch into a photo-shoot the moment they got there. I think, I was guilty of doing that as well. A pro-tip: come really early so that you can get the best of light and space. The bazaar in almost every Middle-eastern country is hard to dismiss. A vibrant selection of fresh fruits, vegetables, teas and yes, your usual innerwear garments are also available right here. Kebabs, Tahdig layered with saffron, butter and dry fruits at Moslem Restaurant in Tehran, Iran. Fancy, a French-Iranian breakfast with some honey and Barbari bread. Crusty rice layered with chicken that has been doused in flavoured warm saffron and melted butter. Garnished with fresh pistachios and pomegranates. Take that all in and drown it with Doogh, a yoghurt drink filled with curdled milk, fizzy water and seasonings, similar to Lassi in India. As I type this, I am drooling with delight. I'll let the pictures do the talking. Wearing scarves and finding coats that are long enough to cover my behind was quite a task. I took three brightly coloured scarves and completely forgot about Iran's end of Muharram period where Shias mourn the murders of Imam Hussain and his family. As a sign of respect, most women are seen donned in black scarves, however, I did see a number of foreigners wearing bright scarves and thought it would be OK. But as it turns out, not really. Because I could pass of as an Iranian, I was swung with glaring looks of disapproval and disdain from the general Iranian population at certain conservative towns and villages. Having said that, wearing the scarf was quite a fun process and the pictures turned out great as you can see. It took me all of 10 minutes every morning to ensure my hair was "decently" intact. From what I also observed, the women in Tehran had really pushed the boundaries of what they can get away fashion wise. This all goes back to 1979, the year that reignited a change of perception of many Iranians regarding their roots and origins. With 60 per cent of the population under 30, a significant number of Iranians hold on to progressive beliefs and denounce any rule that goes against their expression. This explains the voracious cosmetic industry in Iran where going under the knife is seen as a norm. Waking up in the mist of the morning with a view of the scarlet trees in Iran, woke up the poet in me. I would hike, explore, read, capture and grow curious with the Persian way of life as I interacted with locals. Asking them about their day-to-day life, and their fight for freedom. This was clearly not a straightforward trip, rather an observational journey through a barren tourist landscape in early November. I asked beaming Iranians, if they were happy and happy it was, but the desire to break free from the shackles imposed by the West and their own government were apparent. Iran does add a lot of mystery as a travel destination, and while we're seeing an early wave of travellers (like me) visiting to discover the land of Persia, I must admit that the country does attract a different breed of travellers. Seasoned travellers who have covered the entire Central Asia after being on the road for months with their final stop in Iran. Or a Swiss girl who cycled all the way from Switzerland to Iran. Or an Australian girl who had solo camped and hitchhiked throughout parts of Iran. And the rest of the interesting people I met from Ukraine, Russia, Poland, France, Morocco, Vietnam, China and Malaysia too. There was always something to talk about, share and exchange. The villages and deserts are a symbol of beauty in Iran. Abyaneh, is a 2,500 year old village where it is valued for its preserved culture and heritage. The village had a spectacular layout of stepped alleys and multi floor buildings made of mud bricks. Visiting the Maranjab desert at sunset was really quite spectacular. The best part was staying at a Caravanserai where it houses about 25-30 guests. The next day we took a short detour to the salt lake which really was quite something. The Maranjab salt lake is used for salt extraction too. It's better to visit these places with a guide so you can save yourself the trouble of organising logistics. To be honest, I have never experienced hitchhiking before and Iran was probably my first country where I heard how easy it was to hitch a ride. More than just a ride, the people that we met were uniquely interesting. So out we were on the highways with our packs, looking for a ride and within minutes few cars stopped. Some were families, couples and students. We eventually hitched a ride with an engineering student and two Turkish twin brothers which led to dinner, multiple tea-house visits, Google Translate comic relief and friendships that will last for a lifetime. Every time I tell myself I won't hike a hill or a mountain, and that never happens. Just 41 miles, Northeast of Tehran, you'll see an ancient and historic city called Damavand where it is also known as the Silicon Valley of Tehran, as what my host had mentioned. The drive up here was incredibly stunning and the landscapes almost reminded me of the barren desert in Ladakh, India. I was also highly tempted to hike Mount Damavand, the highest peak in Middle East standing at 5,610 metres. That never happened because it was not the right season. In fact, it was the same time where 2 Malaysian climbers had reportedly gone missing. Iran is strategically located right at the center of Afro-Eurasia. It is rightly nicknamed the "Crossroads of the World". For a month-long backpacking trip in Iran, it's the right country for one to hop over and discover other ex-Soviet neighbouring countries that people would never consider. From Iran, I had three options - to head to Turkey, Armenia or Azerbajian. I chose Armenia and to head further into Georgia and parts of Europe. A return ticket to Iran can be quite costly if you do a quick search on Air Asia. A one-way ticket from Tehran, Iran and a return ticket from another European country worked well when I did the math. These are just one of the myriad reasons why I travelled or backpacked to Iran, and honestly visiting a country like Iran, might be a mixed bag for many given the current news headlines. The one perception people get is that there are hardline extremists waiting to attack you but that's not the case at all. I witnessed scores of tour groups, with tourists paying exorbitant fees only because they feared that "Iran is a dangerous country." I'd say put fear aside, and try to explore this place on your own.